On the passing of Winnie Nomazamo Madikizela-Mandela | Fight Back! When Nelson Mandela was sentenced to life in prison for defying the fascist, apartheid regime, Winnie said: “Part of my soul went with him.” The other part of her soul and her heart stayed with the struggle against apartheid and against those racist monsters who ruled South Africa. 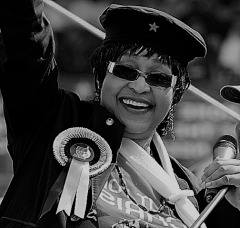 When they arrested her and tortured her she cried out in defiance: “When you strike a woman, you strike a rock.” And for all those years she was banned, the anti-apartheid movement in South Africa, the U.S. and around the world stood in unconditional solidarity with Winnie, demanding her freedom. We loved her and supported her through all those trials and tribulations and never doubted for a minute her dedication. She endured years of being banned and 27 years of forced separation from her husband Nelson Mandela, and she never faltered, never flinched one time in the face of the enemy. As a revolutionary internationalist, Winnie Nomazamo Madikizela-Mandela was a comrade and sister to all progressive humanity and we will always hold dear her legacy and memory in hearts as we continue to fight for freedom.